With nine stencils and hundreds of shapes, the Azure Diagrams template gives you everything you need to create Azure diagrams for your specific needs. Design web apps, network topologies, Azure solutions, architectural diagrams, virtual machine configurations, operations, and much more. 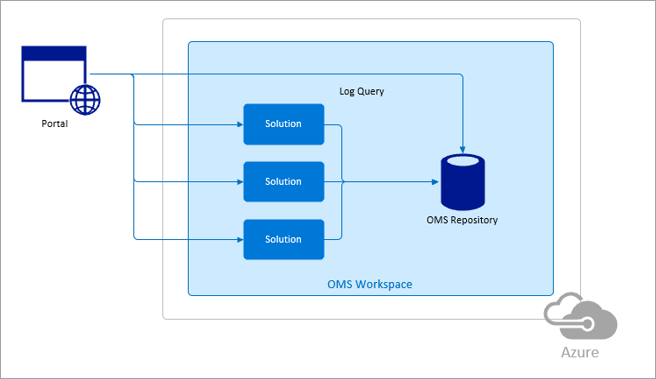 Example: Start with the Operations Management Suite template to visualize and manage your on-premises and cloud environments from a single place. The Azure diagrams template can be accessed in the Visio desktop app or on Visio Online with a Visio Online Plan 1 or Visio Online Plan 2 subscription. See the Cloud and Enterprise templates section below for details on how to access Azure diagram templates for non-subscription or older versions of Visio. Desktop Select File > New > Templates > Software and Database > Azure Diagrams. Online Select File > New > Microsoft Azure Diagrams. Use the many sample diagrams in the Azure solution architectures site to help you decide what you want to do and model your designs. The following table summarizes the stencils with sample shapes to help you see the extensive scope of what’s available. If you have a non-subscription version of Visio, such as Visio Standard 2019, you can find the Azure diagram templates in the desktop app by searching for "Cloud and Enterprise" templates. If you're using older versions of Visio, you can download the stencils from the Azure portal.